The Benevon Model is a mission-centered, four-step, circular process for raising sustainable funding and major gifts from individual donors. When customized and implemented over time, your organization will systematically engage and develop lifelong relationships with donors who truly understand and support your work. This proven non profit fundraising system has been implemented successfully by over 5,000 nonprofit teams. 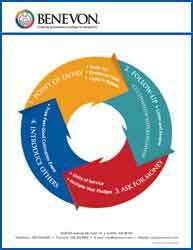 Potential donors get on the cycle by attending a private Point of Entry Event at the invitation of a friend or colleague who serves as an Ambassador for your organization. This succinct, one-hour introductory event educates and inspires guests with the facts and stories about your organization's work, focusing on your three overarching areas of impact and capturing each guest's name with permission. Guests then receive a personal Follow-Up Call to solicit their feedback and see if they would like to become involved in any way, ideally by becoming an Ambassador and hosting a private Point of Entry Event. Those guests who are interested in learning more about your organization are involved and cultivated personally in whatever way they prefer. In the Follow-Up Call, Point of Entry guests who are not interested in learning more about your organization are let off the hook completely. This "Bless and Release" will pleasantly disarm people and, paradoxically, allow them to suggest others who would be interested in attending a future Point of Entry Event. After several personal cultivation contacts to more deeply connect guests to their area of greatest interest, many Point of Entry guests will be ready to be asked for money, either one-on-one or at a Benevon Free One-Hour Ask Event. The Free One-Hour Ask Event is a signature Benevon event. After being cultivated extensively in the months before the event, guests are invited by their Ambassador to attend an inspiring, mission-focused, one-hour free breakfast or lunch fundraising event. At the end of this event, guests are invited to join your organization's Multiple-Year Giving Society by making a gift of at least $1,000 per year for the next five years. The Free One-Hour Ask Event differs from other, more traditional, fundraising events in that all Table Captains have been Ambassadors in the prior year and their guests will have attended a Point of Entry. Also, the Ask Event is free to attend, and there is no obligation for guests to give. Finally, donors are re-connected to the mission of your organization at program-related Benevon Free Feel-Good Cultivation Events, and are encouraged to introduce others to your organization by becoming Ambassadors and hosting their own Point of Entry Events the next year. 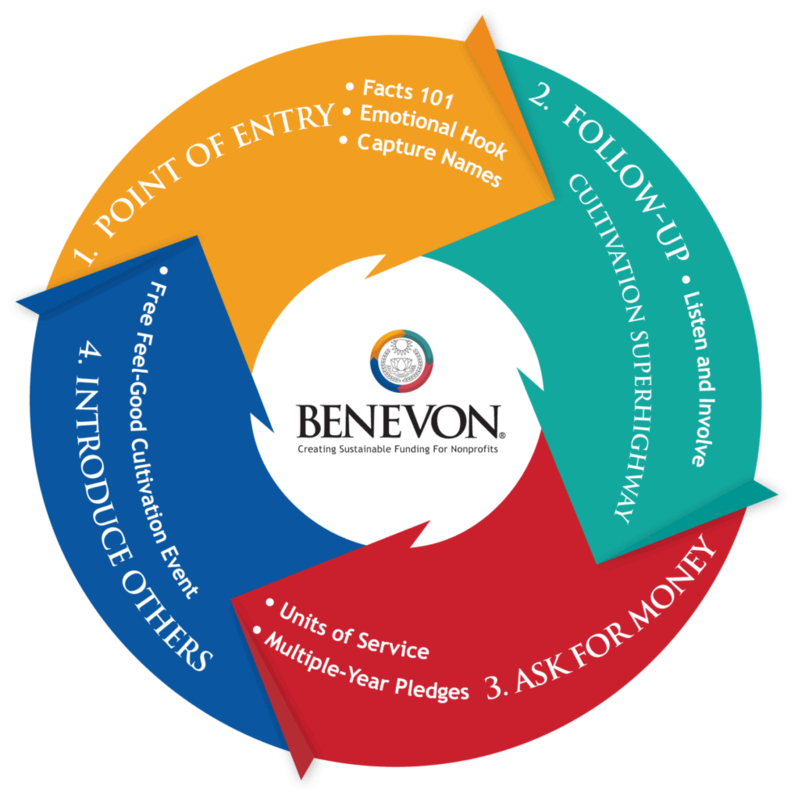 Print the Benevon Brochure and the Benevon Model handout to share with your colleagues. "We have truly infused the Benevon Model into everything we are doing now. Everything we do we bring back to the model. 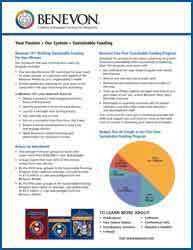 We have found with the Benevon Sustainable Funding Program that when we work it...it works." "The Benevon process is the best method I have seen for getting a group of people working toward a common goal with passion, purpose, and precise vision."